While the ‘Three strikes and you’re out’ philosophy holds true in many circles, it appears UFC president Dana White is leaning towards keeping Dan Hardy inside of his Octagon after posting his third consecutive loss. Exactly one year ago today, Hardy challenged welterweight king Georges St-Pierre for his crown at UFC 111. Fast forward 365 days and the slugger now finds himself in the midst of a three-fight skid. Although the likeable Brit hit the magic number following Saturday night’s unanimous decision defeat to Anthony Johnson, White suggested nothing is set in stone. Hardy owns an impressive 23-9 professional record, with 15 of his wins ending before the final horns have sounded. 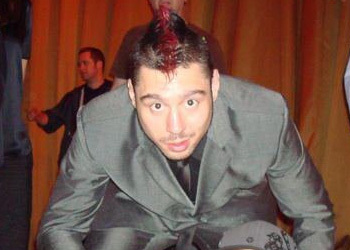 In addition to his charismatic ways, the 28-year-old also hails from Nottingham, England, and our neighbors across the pond love them some Dan Hardy. The former top contender didn’t attend the post-fight press conference. However, he did thumb out a message on his Twitter account. “Disappointed and angry, but physically ok. Thanks for the support everyone,” Hardy tweeted immediately following the loss.